Ackholt is now in the Parish of Aylesham and lies just the other side of the railway-line where the Nonington to Womenswold bridle way crosses the Snowdown to Aylesham road on the southern boundary of the old parish of Nonington. Pronounced Acol (Aye-kul) with a long a and the t dropped as is usual in the old East Kent dialect, the name derives from the Old English (O.E. ): ac; oak & holt ; thicket, literally meaning an oak thicket or wood. To the east of Ackholt is the hamlet of Holt Street, another “holt”, indicating this area was once heavily wooded. The influx of “foreigners” from all over the U.K. in the 1920’s seeking work in the Kent Coalfields led to common usage of a hard C when saying the name, so that it is now generally pronounced as “Ak-olt” when referring to Ackholt Road, and “Aye-kul” when referring to the old hamlet and nearby Acol Bank. Aylesham: possibly from O.E. Aegeles ham; Aegel’s homestead. Now refers to the actual mining village, but before the village was built, it referred to the corner, wood and farm of that name. The earliest reference to Aylesham I have so far found is from 1604 when “John Swanton of Aylesham [in Nonington], yeoman”, was elected as parish constable. The Aylesham referred to here may have been an earlier house or small holding on the site of the later house that stood until the early 1800’s at the southern end of Ackholt Wood, recorded on the 1838 parish tithe map. Barfrestone: also Bason, Barson, Barston: diminutive names in common use until late 19th century for Barfrestone. O.E. Beornfride’s tun; Beornfrid’s farmstead. Used in old documents to refer to Barfrestone i.e. in connection with the Barson mills just within Nonington Parish on its extreme S.W. boundary with Barson. Beauchamps, Beachams, Bechams. 1484 Beauchamps, 1558 Beachams, 1615 Bechams: Wood, Lane and field. Originally part of the knight’s fee of Essewelle, which divided into the sub-fiefs of Esole and Fredville. In the mid-fourteenth century The house and some land at Esole became a part of the holdings of the de Beauchamp family, then Earls of Warwick. This appears to have given the area its name which was first documented in 1484 when “the manors of Fredeuyle and Beauchamp’ “ were sold. It was later recorded as “Le Becham” in the 1501 Essesole manorial rolls; Beachams when the house and land was bought by Thomas Hamon of St. Alban’s in 1558, and Bechams in a list of lands owned by the late Edward Hammod in 1615. The land remained a part of the St. Alban’s estate until the estate was sold in various lots by auction in 1938. Butcher’s Alley, the bridle way running from Esole Street towards Elvington and Eythorne alongside the old butchers premises and up the hill along the western side of Easole Fields. In the 1901 cencus it was referred to as Chalk Hill, probably because there are at least two old chalk quarries or lime pits on its northern side. Brick Field. An old brick making site, probably in the early 17th century to the west of Holt Street Farm and bordering on the north side of Butter Street from the brow of the hill to approximately two thirds of the way to Church Street. Bricks made here were probably used to build Holt Street Farm house and other nearby houses built from the early 1600’s onwards. Its western and northern boundaries are a banked hedge or carvet ,a Kentish dialect word for a shave or shaw. (Shaw: from O.E. scaga; copse. A Kent dialect word to describe a small area of woodland, or large hedge. also Shave, derived from shaw, although it is usually used to describe a long, narrow piece of wood land). Beachams Field and Brickfield Piece in Fredville Park are other sites in the parish that were used for brick-making. Butter Street: Documents from the 1550’s mention ‘5 roods of land in the Parish of Nonington next Harelesstrete / Holestrete (Holt Street) butts’. Butts were where individual holdings adjoined or ‘butted’ together and were often formed by ditched and hedges banks. Several fields in the Holt Street area still have clearly visible boundary banks and ditches, some still dividing modern land holdings. Butter Street runs from Holt Street to Church Street through these ‘butts’ and so was probably originally known as ‘Butts Strete’. As Kentish T’s were, and often still are, pronounced as D’s, ‘Budds Strete’ eventually evolved over the years into ‘Butter Street’. Chalk Hill: see Butcher’s Alley. Chapman’s: Hill and Close, named after a tenant farmer family of that name who farmed in this part of the old parish area in the late 16th and early 17th century, the name was being used on documents by the 1640’s. now partly in Aylesham Parish. Church Street: the name now given to the road going from the Church towards Acholt and Womenswold, It originally included what is now called Pinners Lane. Curlswood Park Farm: Crudes Wod 1283; Croddeswode 1342; Cruddyswood 1425; also Curleswood Park Farm & park Farm: From the O. E. Crudes wudu; Crudes (a personal name) wood . A woodland area of the manor of Wingham, in 1283 Crudes was where Richard Hokemok held two parts and Rikemund the widow of Alexander Crud (from whence the name came) held the third part, Crudes wood then consisted of 244 acres. The later Curleswood Park belonged to the Archbishop of Canterbury being in the 18th century an enclosed deer park. Until the 1920’s the farm house and buildings stood just to the west of the junction of Cornwallis Avenue and Ratling Road, Aylesham. Drove, The: used until the early 1900’s to refer to the lower part of Holt Street from just below the garage to the beginning of Easole Street. The original meaning derives from O.E. draf; a roadway along which cattle were driven. Easole: a hamlet in Nonington parish which now joins up with Holt Street. It was originally a part of the knight’s fee of Essewelle, which divided into the manors of Esole and Fredville, and the name appears to have evolved over the centuries from Essewelle in the Domesday Survey of 1086 to; Eswall’, 1154; Esol, 1303; Esole, 1337; Essole, 1501. Some old maps give derivative spellings but these appear to be due to the way the name was pronounced locally at the time ie., Yewsole 1768 also East Old St., Hazle St, Issel St, Yselle St.
Fredville, House and Park: originally a part of Essewelle Manor. By 1249 Essewelle appears to have divided into Esol (also Esehole & Eshole) and Freydevill, the spelling used in a 1250 legal document. Over the centuries there were many variations in its spelling; Frydewill, 1338; Fredeuyle, 1396; Fredevyle, 1407; Froydevyle, 1430; ffredvile, 1738. The original Freydevill manor was probably centred around the present Holt Street with the first manor house being built on the old Fredville House site possibly as late as the early 15th century. Fredville is traditionally said to derive from the Old French (OF) : freide ville, meaning a cold place, because of its cold, wet, low position. A more likely derivation is from the Old English (OE) frith or frythe, which in Kentish/Jute dialect would have been pronounced “freed”, as the TH ending would have been turned into a D sound, which means wood or wooded country or the edges or outskirts of a wooded area, as in Frydewill, the spelling used in John Colking’s Inquisition Post Mortem of 1338. Holt Street; from holt, a wood or thicket, and adjacent Hangers Hill; from OE. hangra, a wooded slope or ‘hanging wood’, have names indicating a once heavily wooded area. Holt Street also borders the heavily wooded manors of Oxenden (Oxney) to the south and Ackholt, oak wood, to the south-west. The “vill” may derive from “villata”, shortened to “vill” in medieval documents, which indicates a manor. Alternatively it may derive from the Norman French “ville” ,from the Latin “villa rustica”, which originally indicated a farm, but later evolved into meaning a village, indicating a settlement larger than a hamlet, but smaller than a town. Therefore Fredville could have originally meant a settlement or manor next to the wooded area. Frogham or Frogham Street; Frogham, 1250; Frogenham, 1402; Frogham is a small settlement in the south-eastern corner of the old parish of Nonington. In earlier times it was referred to as Frogenham and was a vill’ in its own right. The name has two likely origins: the first a derivation from “froggenna hamm”, the frogs water meadow or flat, low lying area This has some merit, especially in view of the early use of the name “Frogenham”. Adjoining Frogham to the south-west is the ancient manor of Soles, originally Solys, with all that its name implies. Sole derives from the O.E. sol: meaning mud or mire, and which in Kentish dialect could mean a pond or pool of muddy water or a muddy, boggy area. Sole is a very common Kentish place name, appears frequently in East Kent. Indeed, Brodesole was the early name for the present Frogham Farm. However, if it was known for being the home of a lot of frogs a more likely name would have been Froggen Sole or Froggensole. The most likely origin of Frogham, in my opinion, is that it derives from Frogga: or a similar personal name, and ham: meaning a homestead. Hangman’s Hill/Hanging Hill is the slope next to the shave in the field at the southern end of the Nonington cricket ground. From the Old English hangra, a hanging wood meaning a wood on a slope. In the wooded area above the southern end of the Cricket ground is an old chalk hole known as Harry’s Hole. Holt or Old Street, Holestret, 1284; Harelestrete, Holestrete & Holstrete, 1558: a hamlet a half a mile or so to the south-east of the Church, deriving from the O.E. ‘holt’, meaning a thicket. Holt Street was originally clustered around Holt Street Farm. The lower part of Holt, or Old, Streetwas referred to as the Drove. Old Street, often referred to in documents and maps, is simply Holt with the H dropped and the T pronounced as D.
Kittington. Kethampton 1226, Kethamtone 1304, Ketyntone 1330: farm and cottages. From the O.E. ‘cyte hamtun’, meaning ‘home farm where there are cottages’. An extensive manor part of the Manor and, later, College of Wingham at the extreme eastern edge of the parish on the border with Eythorne and Tilmanstone parishes. The large Georgian farmhouse was mistakenly blown up by the British Army during the Second World War, so that now only farm buildings and an adjacent row of cottages remain. Johnson’s Terrace, the row of houses bordering Nightingale Lane at the Holt Street cross roads. Named after the tenant of the land in the late 19th. and early 20th. centuries. Longlands: from the O.E. ‘Lang’’ or long, and land. Now the name of the field opposite Nightingale Cottages much of which now lays under the colliery tip. Mounton (also Monkton) and Mount Ephraim. At the northern extreme of the Nonington parish where it borders Goodnestone. The name, Mount Ephraim, possibly derives from Monkton, via Monnoctons, Moncks, 1615, to Mounkton, the name used on a 1750’s St. Alban’s estate map. Monkton is now the old Gooseberry Hall Farm, which was once part of the Manor of Adisham which was owned by the monks of Christ Church in Canterbury. Monkton literally means ‘the monks farm or manor’. The farm is situated on a cross-roads made by ancient track, now a bye-way called Cherry Garden Lane, crossing the ancient Womenswold to Nonington to Chillenden and beyond highway which is now a combination of metalled road (Church Street and Pinner’s Lane in Nonington), bridleway and footpath. Nonington or Nonnington: Nunningitun, 1070’s; Nunynton, 1337; Nonyngton,1460; Nonyngton’ , 1484; Nunnington, 1615. The ownership of Oesewalum by the Benedictine Abbeys of Minster on the Isle of Thanet and Southminster at Lyminge from the late eighth century onwards is almost certainly the origin of Nonington or Nonnington which evolved over the centuries from Nunningitun, recorded circa 1070, which itself evolved from Nunn-ingtūn. This name for the settlement at Oesewalum would have come from the Old English “nunne”; which itself derived from the Ecclesiastical Latin “nonne”, and “ingtūn”; the nuns farm, village or estate. The prevailing widespread current opinion amongst place name scholars is that “ing” is a singular suffix which, when paired with “tūn”, meaning a farm, village or estate, had an associative function, i.e. “called after”, which in this case is the nuns of the two abbeys. This use of “ingtūn” as a suffix also appears to date the naming of the settlement at Oesewalum to the late eighth or early ninth centuries as early credible examples of “ingtūn” seem only to begin to appear in Mercia or its West Midlands territories in the second half of the eighth century and do not appear in charter descriptions of estates in Kent until in the late 780’s, around the time that Mercia consolidated its control over the previously independent Kingdom of Kent. This is also the period in which Oesewalum belonged to the abbesses Selethryth and Cwoenthryth. Some three quarters of a mile to the north-east of Nonington hamlet along the Chillenden road is the small estate of Monkton, the Monk’s farm, part of the Manor of Adisham which had been given to ChristChurch in 616. Monkton also stands on a cross-roads formed by the Nonington to Chillenden road and an ancient track-way or “pilgrim’s road” running from Canterbury through Bekesbourne, Bossingham, near Adisham, through the present Goodnestone Park and then along the present Cherry Garden Lane on the north-eastern boundary of Nonington parish and on towards Eythorne and beyond. 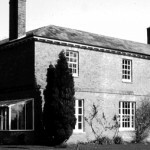 Therefore it may have been called the Nunn’s estate to differentiate it from the Monk’s farm, as the two were located in similar situations and were close together. Originally Nonington was the name given to the area around the church, which was mentioned in a list made for Archbishop Lanfranc in the 1070’s or 80’s as “Nunningitun”. Oxney Wood. Oxinden, 1278; Oxenden 1535; Oxena denn; oxen, meaning cattle, denn, meaning woodland pasture. The Oxenden family, for many years prominent in East Kent affairs, took their name from the manor of Oxinden, part of the Manor of Wingham which was once centred on the present Oxney Wooden, The name Oxney Forestall, still in use, indicates the area of the manor buildings as a forestall was the area in front of, or leading to, a manor house. Oxinden seems to have evolved into Oxney at sometime during the 17th century, possibly via oxen ley (O.E., ‘leah’, meaning a meadow or grazing land) as ox meadow or grazing, is very similar in meaning to Oxinden’s original meaning. Pinner’s, Pyner’s: Hill, Wood and Lane. ‘Pynnars Helle’ is mentioned In an 1487 document. The name appears to derive from the Pyner family who farmed in the parish from at least the late 15th to the early 19th centuries, Long Pinners Wood, of which a small remnant still stands to the rear of “Highleas” at the top of Old Court Hill, is referred to in the 1626 Boys marriage settlement. Ratling: also Rytlinge c.1100; Ratlyng, 1453. From the Old English (O.E.). ryt hlinc; lit. rubbish slope, an area of little use for agriculture. Ratling is now part of Aylesham parish. Ruberry or Ruberries: 1415 Rowbergh, 1415; Rowbarrows,1626; Redberry, 1839: Downs and Woods. From the O.E. ‘ruh’, meaning rough and ‘beorg’, meaning hill or barrow, three of which are still visible on Three Barrows Down. Ruberry Downs extends from ‘The Roman Road’, the local name for an ancient track way now forming part of the North Downs Way, and the adjacent Three Barrows, to Nightingale Lane, which runs from Holt Street cross roads to Frogham. Ruberry Wood was divided by the construction of the London to Dover railway in the 1860’s into Big and Little Ruberrys Woods. Part of Big Ruberrys Wood and the nearby Broomhill Wood are now covered by spoil from Snowdown Colliery. Slay Lane, also Sleigh Lane: From the O. E. ‘slay’, a track running through gorse. This bridle way runs from the car park opposite the ‘Royal Oak’ in Holt Street into Fredville Park and then divides with one path going through Iron Fence Wood to Mill Lane and the other onto Sheerway Gate at the southern end of Fredville Park. Sheerway Gate. A sheer way or shire way is Kent dialect for a track or road going through private land i.e. a park. A 1750’s map of Church farm shows the footpath running from church farm to Goodnestone as a shereway, Shepherds Gate is an alternative name for the Fredville Park Sheer Way Gate on the 1839 parish map. Stafflands: Woods and fields.There are fifteenth century references to Stanner Lands, stony lands, which by the early nineteenth century had become Stavver Lands and in the 1856 Soles Court manorial roll is referred to as Steverland. Later in the 19th century this appears to have evolved into the still used Stafflands. Soles Court, now Soles Court Farm, Soles 1086. The name derives from the O.E. sol; mud or mire, as in Kentish dialect it means a pond or pool of muddy water. Soles Court was mentioned in the Doomesday Book, now consists of farm buildings only. The surrounding woodland has extensive wood banks, probably pre-Norman. Tygh, Tigh, Tye: wood, hedge, bottom & close, from the .O.E. ‘tye’, meaning common pasture, ie. held in common for communal use, and extensive in area, probably as part of the manor of Kittington. The wood grew to the south of the Nonington to Elvington road but was grubbed out in the 1960’s, a part of it having been for many years a regular seasonal camp site for Romany travellers. A small area was reserved as a camp site until the early 1970’s when it fell into disuse. Tye Wood hedge has a foot path running through it which, until the late 19th century, was part of an ancient road from Eastry through Kittington to Frogham and beyond. I really appreciate the work you have put together for Nonington. I am interested as my ancestors starting with Giles Solley married Hester Marsh 1820 March 4 at the Parish Church in Nonington. All there children except for a couple (who werer baptized in Canterbury) were born, baptized, married and bured there. I will be in Nonington after the 8th of July. From Canterbury, where we are staying, I hope to go to all the small village my other ancestors were from. Thanks for the message, I hope you enjoy your visit. I can read that the Prioress of Nonynton/Nenynton is owing for her temporalities in Nonynton from 1337-45 – but the entry does come under what I think is a subsection dealing with various abbeys/priories/prebendaries etc and their obligations, headed by Beaulieu Abbey, with the marginal subheading Hampshire – so Nonynton in this (presumably royal) case could be anywhere, and yes it is a fairly common name. I’ll check the other matches you mention – Nuneaton of course was my first thought, but I can’t find much detail about its early history, which is frustrating. Thanks for contacting me, at least I now know the site is being read. Good luck with your research. which mentions “a mysterious prioress of Nonyngton” who appears amongst the alien religious on the Pipe Rolls of 15-25 Edward III (?1341 onwards) as paying for her temporalities in “Nonyngton”. Is there any more information on the alien priory of Lymington/Nunnington apart from what can be gleaned from similar sources [eg Dugdale’s Monasticon], say an old or recent local history publication? Thanks for any help in this. Thanks for the info, but it’s a different Nonington. There are quite a few of them in England, the best documented is in Yorkshire, but there are some in the West Country. The Freville’s unfortunately have no connection to Fredville, there was no de Fredville family. There are at least a couple of places in France called Freville, these could be the origin of the name. Good luck with your search, please let me know if you discover anything for Nonington in East Kent.